One of the benefits of the very strong market adoption of our X1 Social Discovery software is that we receive a significant amount of invaluable and excellent customer feedback from very seasoned eDiscovery and law enforcement professionals. Many of these experts report that a good number of their social media investigation and collection cases also require general website collection. For instance, a person on Facebook promoting infringing technology may also be posting relevant information to industry web bulletin boards or maintaining their own website. It is thus important that a social media eDiscovery and investigation process feature integrated web collection and social media support. For an effective process, website data should be collected, searched and reviewed alongside social media collections in the same interface. The collected website data should not be a mere image capture or pdf, but a full HTML (native file) collection, to ensure preservation of all metadata and other source information as well as to enable instant and full search and effective evidentiary authentication. All of the evidence should be searched with one pass, reviewed, tagged and, if needed, exported to an attorney review platform from a single workflow. To illustrate what this looks like in the field, we recorded an 8 minute demonstration based in part upon a real life example reported to us by one of our customers. This case study, performed by our CTO Brent Botta, involves the collection of social media data as well as message board posts on the web. Importantly, this evidence is consolidated into a unified workflow to be searched in one single pass. 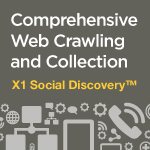 The investigation features X1 Social Discovery as the platform, which now features automated and integrated web crawling capabilities in addition to its renowned functionality for the collection and analysis of Facebook and Twitter content. We believe this is the only solution of its kind to collect website evidence both through a one-off capture or full crawling, including on a scheduled basis, and have that information instantly reviewable in native file format through a federated search that includes multiple pieces of social media and website evidence in a single case. Up to millions of web captures and social media items are searched instantly with the patented X1 search, tagged and exported from a single interface. Like social media content, web pages bring their own unique but important challenges for evidentiary authentication. In the next week, we will be posting on best practices for the collection and authentication of web pages as evidence, so stay tuned!